Pre-orders available now on Amazon.com – click here to go to Amazon and purchase the book. The objective of this book is to re-visit lean principles and then apply them sympathetically – in a highly practical approach – to the specific needs of pharmaceutical processes, which present significantly different challenges to more mainstream manufacturing processes. With decreasing profit margins, increasing cost pressures, growing regulatory compliance concerns, mounting pressure from generic drugs and increasing anxiety about the future of healthcare reimbursement, pharmaceutical manufacturers are now forced to re-examine and re-assess the way they have been doing things. In order to sustain profitability, these companies are looking to reduce waste (of all kinds), improve efficiency and increase productivity. Many of them are taking a closer look at lean manufacturing as a way to achieve these goals. A major goal of the book is to highlight those problems and issues that appear more specific or unique to biopharmaceutical manufacturing situations and to provide some insights into what challenges are the important ones to solve and what techniques, tools, and mechanisms to employ to be successful. The emphasis of the book is to approach the subject from a pharmaceutical practitioner’s point of view rather than to create another generic treatise on lean manufacturing, of which there are ample editions in the marketplace already. 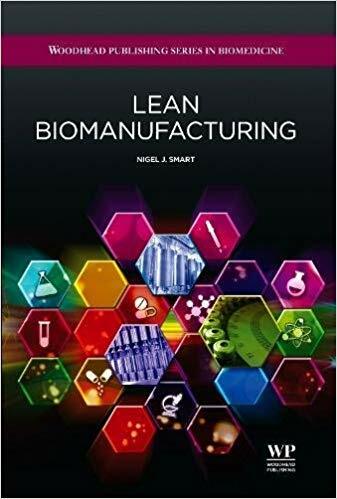 Maintains a focus on the issues associated with the application of lean principles to biomanufacturing, rather than the application of them to generic manufacturing situations. Features practical examples of factors which can affect biopharmaceutical processes, and how these can be ameliorated to improve efficiency. Covers seven key factors which require integration to run an efficient biopharmaceutical process, including IT and regulatory compliance considerations specific to biopharmaceuticals. Discusses how to be lean even when contracting through a contract manufacturing organization. Discusses single-use systems, and how these can form part of a lean biomanufacturing strategy. Nigel Smart PhD is a 30 year veteran of the biotechnology industry who has spent his career involved in developing and manufacturing numerous recombinant protein, monoclonal antibody and vaccine products. He holds a Bsc from the University of Leicester, and an MSc and PhD in Fermentation Technology/Biochemical Engineering from the University of Manchester. His career has spanned academia, Big Pharma and progressive biotechnology companies involved in cutting-edge biopharmaceutical products. For the last eleven years, he has been a much sought-after consultant solving operational problems and compliance related issues to the pharmaceutical and biopharmaceutical industry. This has also included advising the US government on manufacturing strategies to produce a variety of biological countermeasures for the biodefense program. More recently, Dr. Smart has developed a passion for applying lean principles to these processes to enhance efficiency, reduce waste and increase process profitability. This passion is fast earning him a Thought Leadership reputation for his aggressive innovative approaches to lean into what many feels is a difficult field to achieve lean success. As Managing Partner of Smart Pharmaceutical Consulting, Dr. Smart is now an energetic proponent of lean approaches to biopharmaceutical manufacturing processes and leads the company’s business team in this area. This book is of use to those within biotechnology and biopharmaceutical industries, including vaccine manufacturers. It is targeted at both senior management and middle or operational management, and the highly practical focus should also give it wider appeal to industry practitioners. University or college students learning about bioprocess technology would find this a useful text to augment their traditional bioprocess training, and institutions which teach bioprocess technology are starting to think about lean in relation to bioprocessing, so this text is timely.